Junior Seau, one of the NFL's best and fiercest players for nearly two decades, had a degenerative brain disease when he committed suicide last May, the National Institutes of Health told The Associated Press on Thursday. Results of an NIH study of Seau's brain revealed abnormalities consistent with chronic traumatic encephalopathy (CTE). "The brain was independently evaluated by multiple experts, in a blind fashion," said Dr. Russell Lonser, who oversaw the study. "We had the opportunity to get multiple experts involved in a way they wouldn't be able to directly identify his tissue even if they knew he was one of the individuals studied." The NIH, based in Bethesda, Md., conducted a study of three unidentified brains, one of which was Seau's. It said the findings on Seau were similar to autopsies of people "with exposure to repetitive head injuries." Seau's family requested the analysis of his brain. 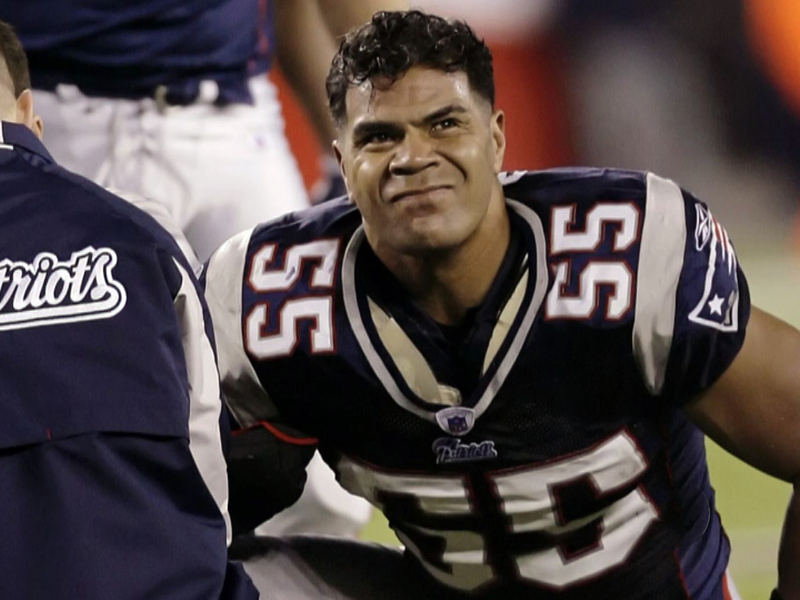 Seau was a star linebacker for 20 NFL seasons with San Diego, Miami and New England before retiring in 2009. He died of a self-inflicted shotgun wound. He joins a list of several dozen football players who had CTE. Boston University's center for study of the disease reported last month that 34 former pro players and nine who played only college football suffered from CTE. "I was not surprised after learning a little about CTE that he had it," Seau's 23-year-old son Tyler said. "He did play so many years at that level. I was more just kind of angry I didn't do something more and have the awareness to help him more, and now it is too late. "I don't think any of us were aware of the side effects that could be going on with head trauma until he passed away. We didn't know his behavior was from head trauma." That behavior, according to Tyler Seau and Junior's ex-wife Gina, included wild mood swings, irrationality, forgetfulness, insomnia and depression. "He emotionally detached himself and would kind of `go away' for a little bit," Tyler Seau said. "And then the depression and things like that. It started to progressively get worse." He hid it well in public, they said. But not when he was with family or close friends. "We appreciate the Seau family's cooperation with the National Institutes of Health," the league said in an email to the AP. "The finding underscores the recognized need for additional research to accelerate a fuller understanding of CTE. "The NFL, both directly and in partnership with the NIH, Centers for Disease Control and other leading organizations, is committed to supporting a wide range of independent medical and scientific research that will both address CTE and promote the long-term health and safety of athletes at all levels." NFL teams have given a $30 million research grant to the NIH. The NFL faces lawsuits by thousands of former players who say the league withheld information on the harmful effects concussions. According to an AP review of 175 lawsuits, 3,818 players have filed suit. At least 26 Hall of Famer members are among the players who have done so. Seau is not the first former NFL player who killed himself, then was found to have CTE. Dave Duerson and Ray Easterling are others. Duerson, a former Chicago Bears defensive back, left a note asking for his brain to be studied for signs of trauma before shooting himself. His family filed a wrongful death suit against the NFL, claiming the league didn't do enough to prevent or treat the concussions that severely damaged his brain. Easterling played safety for the Falcons in the 1970s. After his career, he suffered from dementia, depression and insomnia, according to his wife, Mary Ann. He committed suicide last April. Mary Ann Easterling is among the plaintiffs who have sued the NFL. "It was important to us to get to the bottom of this, the truth," Gina Seau said, "and now that it has been conclusively determined from every expert that he had obviously had it, CTE, we just hope it is taken more seriously. "You can't deny it exists, and it is hard to deny there is a link between head trauma and CTE. There's such strong evidence correlating head trauma and collisions and CTE." Tyler Seau played football through high school and for two years in college. He says he has no symptoms of any brain trauma. Gina Seau's son Jake, now a high school junior, played football for two seasons, but has switched to lacrosse and has been recruited to play at Duke. "I didn't have to have a discussion with him after we saw what Junior went through." Her 12-year-old son, Hunter, has shown no interest in playing football. "That's fine with me," she said. Meanwhile a new study of NFL players adds to the evidence that repeated head blows absorbed during a football career could lead to changes in the brain that affect the athletes' behavior. The study, published Jan. 7 in JAMA Neurology, found retired NFL players were more likely to report cognitive impairment and depression and show physical brain changes on an MRI scan compared to healthy individuals. The new study involved 34 retired NFL players, average age of 62, who underwent neurological and neuropsychological tests. Twenty-six of them underwent detailed brain scans, and were then compared to brain scans of healthy individuals. All but two had suffered concussions during their playing careers. Of the 34 retired pro football players, 20 were considered cognitively normal. As for the rest, eight were diagnosed with depression, eight reported mild cognitive impairments, four reported fixed cognitive deficits and two had dementia.